These shrimp cocktail appetizers are fast and easy to make. 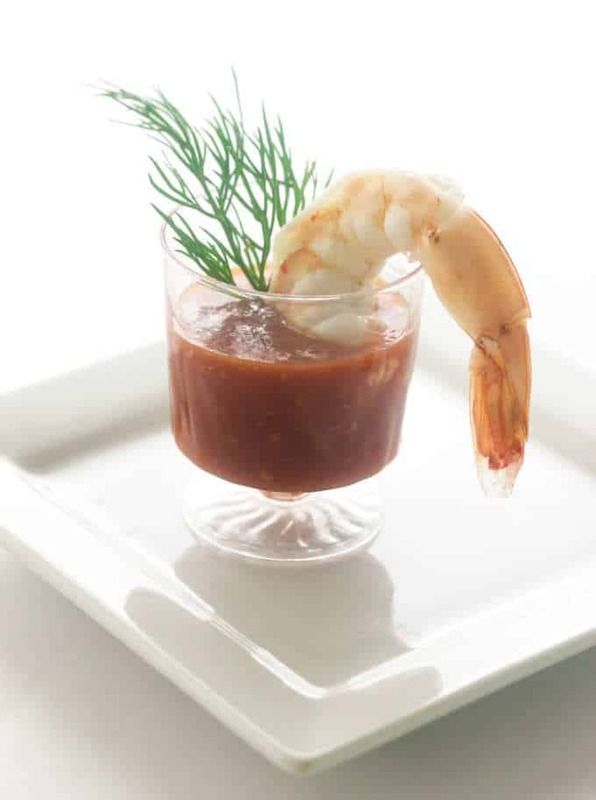 If you use a store-bought jar of cocktail sauce then it will only take you five minutes to poach the shrimp. You will have plenty of time left to get ready for your party. 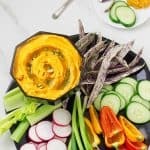 With Thanksgiving over and Christmas very near it has been a busy, hectic time at our house and I have been thinking of fast, easy appetizers to serve guests. These shrimp cocktail appetizers are perfect! I am planning a special event that I need to include three nice appetizers. I recently posted my Goat Cheese-Sweet Red Peppers Bruschetta and the Pear Paste with blue cheese which are on the list and these little shrimp cocktails will complete the list. Recently, I was in the Party City shopping for some party invitations and as soon as I saw these cute little miniature glasses I knew exactly what to do with them. 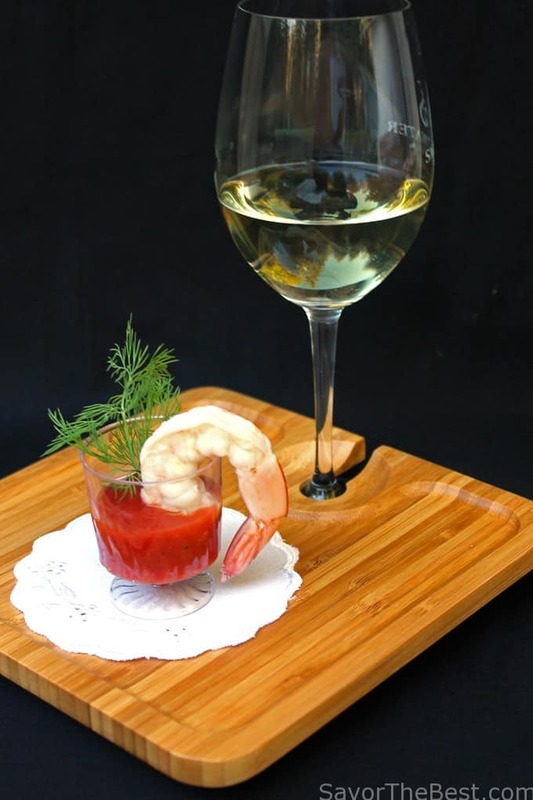 They make the best shrimp cocktail appetizer cups for individual servings. 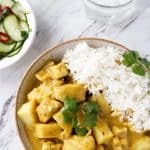 This is such an easy recipe and it really frees up your time so you can enjoy your guests. The only cooking that is involved is the poaching of the shrimp, then just portion out some commercial bottled cocktail sauce into pretty little glasses, add a shrimp and a feathery snip of fresh dill. All that is left to do is put a dish of the poached shrimp in a larger dish of ice to stay cold and the guests can help themselves. 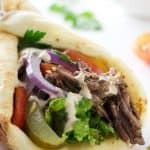 This is a delicious, easy, fast appetizer and now it is the time to pour a glass of wine and join your guests. First, make sure all the shrimp stay cold. Fill a bowl with ice and place the poached shrimp on top of the ice. 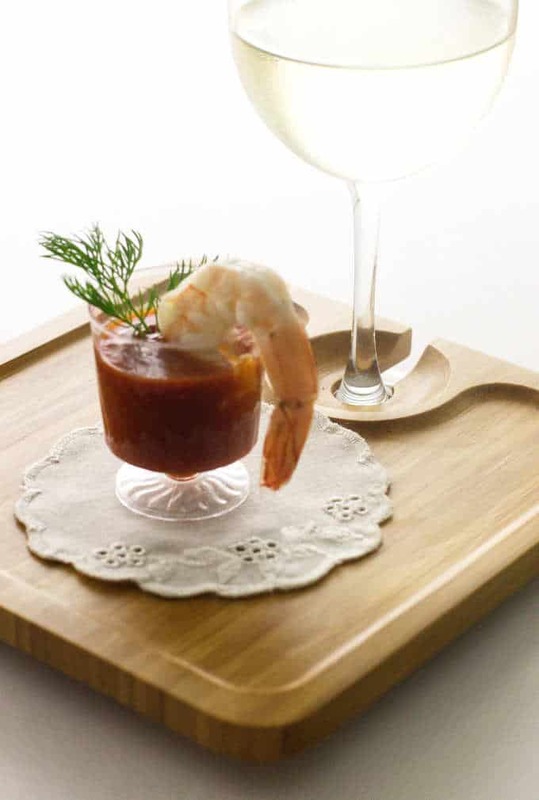 If you use these shrimp cocktail appetizer cups to serve the appetizers then pour some cocktail sauce into several of the miniature cups. 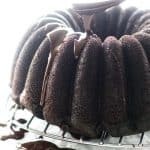 You will want to have at least as many cups as there will be guests. Before the guests arrive, place a shrimp and some dill in each cup. You should have several more shrimp left over in the bowl if you make enough for each guest to have 3 or 4 shrimp. When the guests eat the shrimp out of the miniature cocktail cups then they can replace it with the ones that are sitting on ice. The shrimp cocktail appetizer cups should hold enough cocktail sauce for three or four shrimp. How long can I keep shrimp cocktail out? The FDA has established some guidelines for serving and storing cooked shellfish. When it is time to serve the shrimp cocktail, make sure it does not stay out longer than 2 hours. If it is a hot summer day over 90°F, then don’t leave it out longer than 1 hour. This is why it is best to wait until the guests are about to arrive before you put the shrimp cocktail out. Make sure that the shrimp stay cold while they sit out. As suggested above, you can either keep them on a layer of ice or place them in a bowl that has been set on ice. If it is going to be awhile before eating them then you should store them in the fridge. 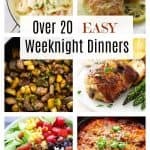 To make this easy, you could arrange all the little shrimp cocktail appetizer cups on a platter and set the whole platter in the fridge. That way, all you have to do when the guests arrive is pull the platter out of the fridge and serve the guests. Can I freeze shrimp cocktail? As long as the shrimp has been kept at a safe temperatures, it is safe to freeze any leftover shrimp cocktail. We recommend that you freeze the cooked shrimp separately from the cocktail sauce. How to thaw frozen, cooked shrimp. Here are two safe ways to thaw frozen shrimp. The best way to thaw cooked, frozen shrimp is to set them in the fridge overnight. If you can place them in a strainer that is set over a bowl then they won’t sit in the liquid as they thaw. If they sit in liquid for very long then all the good shrimpy flavors will become diluted and the shrimp will taste bland. 2. Thaw under running water. If you’re in a hurry, you can run cold water over the shrimp. This technique is really better for thawing raw shrimp because the water can rinse away some of the flavors in the cooked shrimp. But as long as you don’t run the water for too long, it works pretty well for cooked, frozen shrimp. Just place the frozen shrimp in a colander and run cold tap water over them. Stir or shake them around to redistribute them as they thaw and make sure all the shrimp get a shower of cold water. It should take about 8 to 10 minutes to thaw all the shrimp this way. When the shrimp are thawed you can either keep them chilled and use them for a shrimp cocktail or in salads, or you could re-purpose them by cooking them in a hot pasta dish. If you choose to re-heat them then keep in mind that shrimp will get pretty tough and rubbery if they are overcooked. The best way to re-heat cooked shrimp is to add them to your hot meal at the very end of the cooking time. It only takes a couple of minutes to re-heat the cooked shrimp. 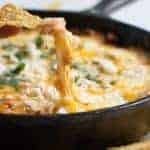 Did you make this shrimp cocktail appetizer? We would love to hear from you. How did you serve your shrimp cocktail? Drop us a comment below. 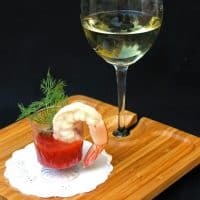 A shrimp cocktail appetizer that is easy and quick to put together. This makes a delightful appetizer that will 'wow' your guests. Prepare a large pan of ice-water for immersing the hot shrimp into, set aside. In a saucepan over medium-high heat, add the water and salt and bring to a boil. Remove the saucepan from the heat and add the shrimp and allow to poach until barely pink, about 4-5 minutes. Pour the water and shrimp into a colander to drain, then immediately plunge the drained shrimp into the prepared bowl of ice water to stop the cooking process. Allow to cool in the ice water, then drain and place on a double thickness of paper towels, patting them dry with additional paper towels. 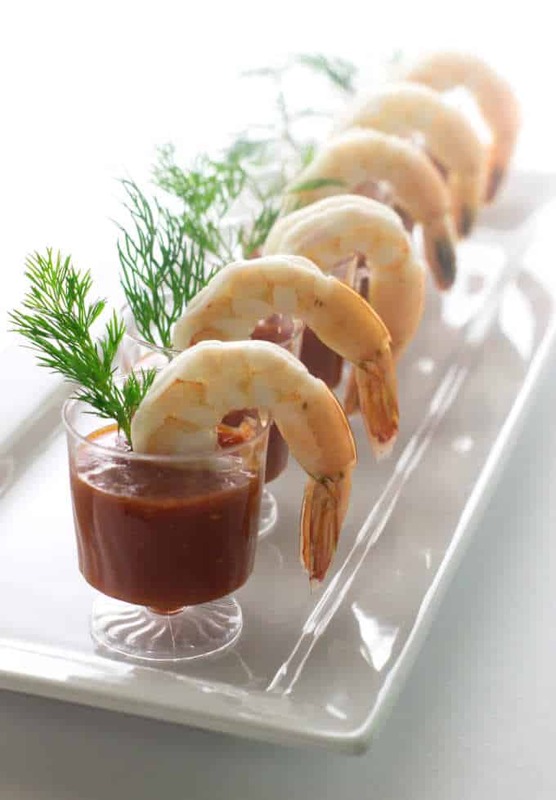 While the shrimp are cooling, add 2 tablespoons of cocktail sauce to each miniature container and hang a cooled shrimp over the side. 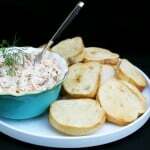 Garnish with a feathery snip of fresh dill, arrange the appetizers on a tray and serve. Additional shrimp may be presented in a separate bowl sitting in ice for guests to help themselves. Where can I buy the footed cups? Hello, Yvonne….I bought mine locally at Party City, aren’t they the cutest little cups!